How to sign up for a ReefTools Live Account. How to set up a profile for your aquarium. How to track your aquarium parameters. Australia is often tauted as being home to the most venomous animals on the planet. And it seems as if Australia’s reefs are no different. Stonefish, of the family Synanceiidae, are a sedentary fish, which are widely sought after for it’s remarkable beauty. Kidding of course. 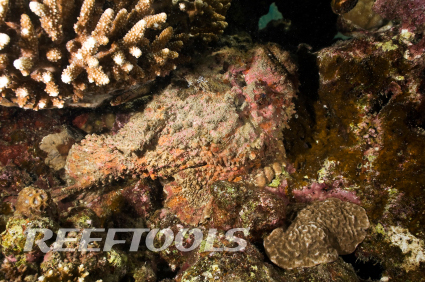 The Stonefish looks and act exactly like a stone, making it almost undetectable when stationary against a background of sand, rocks or corals. 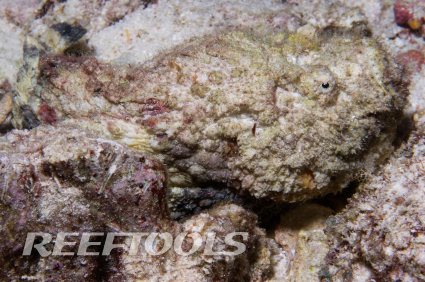 So effective are the stonefish at camouflaging itself, that divers over step on them inadvertently. The stonefish employs 13 dorsal fin spines, capable of delivering potent neurotoxins that are dangerous and even fatal to humans. Depending on the depth of the penetration, these toxins will cause severe pain, paralysis, and tissue death. Although the toxin can prove fatal if left untreated, reported deaths have been extremely rare since the invention of an anti venom. Immediate treatment with hot water (minimum of 113 degrees F) has been shown to relieve pain in almost every case. Well, anti venom or not, I think I’ll be watching where I step. © 2012 Reef Tools. All rights reserved.